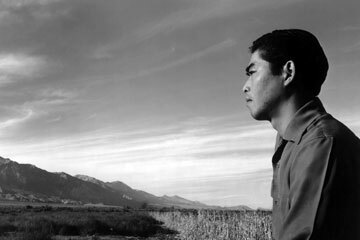 Ansel Adams photographed Tom Kobayashi, a Manzanar Relocation Center resident, at its north field in 1943. Adams visited Manzanar to speak to the community there and photograph internees for a book he published, titled "Born Free and Equal." Fifty of those images will be on exhibit at the Honolulu Academy of Arts beginning Thursday. ANSEL ADAMS' renown is about as monolithic as the landscapes he captured on film. The legendary American photographer was an environmentalist, and he used his craft to convey the grandeur of nature, which ultimately promoted his causes. Place: Honolulu Academy of Arts, 900 S. Beretania St. Admission: $7 general; $4 seniors, students and military; children 12 and under free. Also: Slide lecture by guest curator Anne Hammond, 2 p.m. Sept. 10, Doris Duke Theatre at Honolulu Academy of Arts, free. During World War II, Adams put his elevated consciousnesss, celebrity and talent to work addressing another plight: that of Japanese-Americans interned by the United States during World War II. 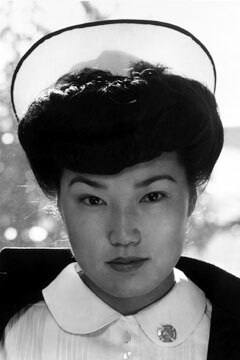 Adams was allowed to enter Manzanar War Relocation Center in California in late 1943, where some 10,000 internees lived. He planned to photograph the community and publish a book of images that would prove Manzanar citizens were no less American than those outside the confines of the barbed-wire fences. That body of work, comprising individual and community portraits, will be on display Thursday, through Oct. 29, at the Honolulu Academy of Arts. The academy gathered approximately 50 prints for the exhibit from the Center for Creative Photography at the University of Arizona, the Library of Congress and the Japanese American National Museum, with one from its own collection. While most of Adams' work at the camp focused on internees, he did indulge his passion for nature with photo- graphs of the desert valley of Manzanar, a former farm and orchard community. The area's water supply had been diverted decades earlier to Los Angeles, and Adams' pieces captured the Japanese farming community bringing life back to the land. Adams published his book, titled "Born Free and Equal," hoping to influence public opinion. The camps were scheduled to close in 1944, and Adams intended his photo essays to help ease the internees' adjustment back into American society. The book became a bestseller in his hometown of San Francisco, but wider distribution was hindered by wartime racism. 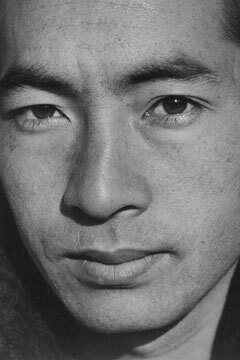 Today, Adams' work is still considered to be among the best photographic documents of Manzanar. Through his photography, Adams attempted to show that internees were just as American as everyone else. 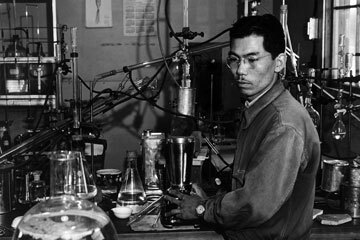 He photographed Frank Hirosawa working in his laboratory. 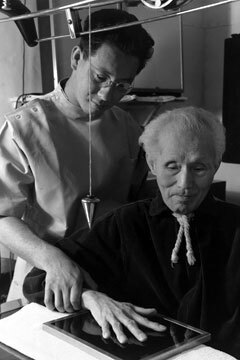 X-Ray technician Michael Yonemitsu and Harry Sumida. 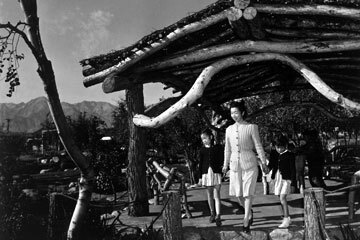 Mrs. Nakamura took her children out to the Manzanar park, which its residents built on their own. 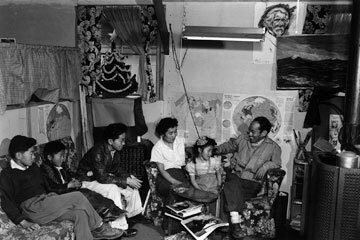 Interned families did their best to make a home at Manzanar; Toyo Miyatake and his family posed for Adams in 1943. A portrait of Yuichi Hirata. 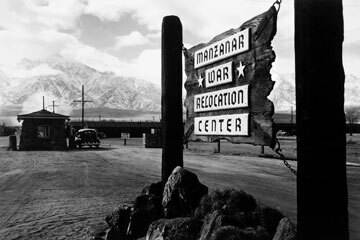 Adams captured the vast desert setting in which Manzanar War Relocation Center was instituted, above.